This is a nice Mac desk featuring a MacBook Pro 15″ atop a Griffin Elevator Laptop Stand hooked up to an external 20″ Apple Cinema Display and an iPad sits alongside them both. Under the desk is a Mac Pro, but I don’t know if it’s in use… thanks for noticing that Randy! This setup comes from Flickr. 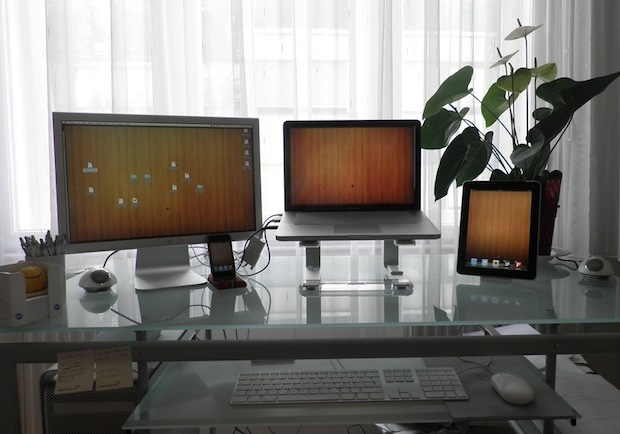 Don’t forget to check out even more Mac setups. so what’s the use of the Mac Pro down low? or is it just not worth mentioning? I didn’t even see it, maybe it’s not hooked up to anything? Good eye! « Is Apple Going to Kill Jailbreaking with iOS 5?